So many busy people are tuning in to podcasts, audio books and other audio-only media because of a couple of reasons. There's been a recent explosion of amazing content, so there's so much to listen to. People are also finding that they can listen in the car, on the commute, in the gym, walking the dog—basically any activity where they can plug in their headphones and listen while doing another activity. Podcasts consist of a variety of content—educational, entertainment, news, politics, lifestyle and health, and much more. Ready to start listening? Let's get started. Use the app of your choice—There are many ways to listen (directly on a show's website, for instance). You can also listen to podcasts via Spotify, Apple Music, and your Amazon Echo. Subscribe—Start subscribing and listening! You can subscribe to podcasts you love to make sure you don't miss the latest episode. Depending on your app, you can download the episode to your device and listen anytime you're away from wi-fi (perfect for long drives and flights). Or, if you've got more data on your phone than memory, you may choose to stream episodes instead of download them. We may be taking a few weeks off this summer, so catch up on past episodes of IRTA's podcast: Indiana Edcast. Then, listen to some of our favorites listed below! Relax and let someone else do the teaching this summer! 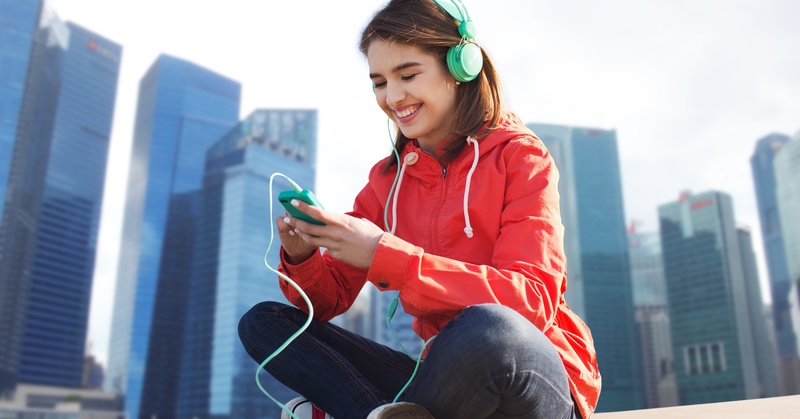 Plug in your headphones and subscribe to these entertaining, educational podcasts. You might find some inspiration for innovative teaching methods, as well. Grammar Girl provides short, friendly tips to improve your writing. These quick grammar, punctuation, style, and business tips will make you a better and more successful writer. Host Wendy Zukerman takes on fads, trends, and the opinionated mob to find out what’s fact, what’s not, and what’s somewhere in between. This season, the podcast is tackling organic food, attachment parenting, gun control, fracking, and more. A public radio program and podcast about language examined through history, culture, and family. From BBC Radio, this podcast team tries to make sense of the statistics which surround us all. The short episodes are perfect for a quick dose of knowledge. The Dave Ramsey Show is about real life and how it revolves around money. Dave talks about how to manage and budget your money, get out of debt, build wealth, and live in financial peace. Imagine you could call up a friend and say, "Meet me at the bar and tell me what's going on with the economy." Now imagine that's actually a fun evening. A weekly dose of just the right medicine to help you get out of debt, save more money, and break the paycheck to paycheck cycle. Highly focused and practical! The Moth stories are true, as remembered by the storyteller and always told live. Funny, poignant and human. Listen to their huge library of stories going back to 1997. Sets the bar for radio journalism, storytelling and production. There's a theme to each episode of This American Life, and a variety of stories on that theme. Most of the stories are journalism, with an occasional comedy routine or essay. There's lots more to the show, but it's sort of hard to describe. Latin for invisible things, the show is about the invisible forces that control human behavior. Co-hosted by Lulu Miller, Hanna Rosin and Alix Spiegel, Invisibilia interweaves narrative storytelling with scientific research that will ultimately make you see your own life differently. A beautifully produced show about curiosity. Where sound illuminates ideas, and the boundaries blur between science, philosophy, and human experience. THE award-winning podcast that got everyone listening to podcasts. Serial is a podcast from the creators of This American Life, hosted by Sarah Koenig. Serial tells one story—a true story—over the course of a season. The most popular podcast of 2017. S-Town is a new podcast from Serial and This American Life, hosted by Brian Reed, about a man named John who despises his Alabama town and decides to do something about it. The Peabody Award-winning weekday magazine of contemporary arts and issues, Fresh Air is one of public radio's most popular programs. Hosted by Terry Gross, the show features intimate conversations with today's biggest luminaries. Here’s The Thing is a series of intimate and honest conversations hosted by Alec Baldwin. Alec talks with artists, policy makers and performers – to hear their stories, what inspires their creations, what decisions changed their careers, and what relationships influenced their work. Bullseye is a public radio show focusing on the best pop culture has to offer. Host Jesse Thorn conducts in-depth interviews with the people who create today's most interesting and thought-provoking television, movie, music, and more. Each episode, author Tim Ferris deconstructs world-class performers from eclectic areas (investing, sports, business, art, etc.) to extract the tactics, tools, and routines you can use. This includes favorite books, morning routines, exercise habits, time-management tricks, and more. This is not a show for foodies. It's for eaters. Dan Pashman offers entertaining episodes tackling hard hitting questions like, is it OK to keep tomotoes in the refrigerator, and asks Alton Brown his favorite way to make eggs. Dan Harris is a fidgety, skeptical ABC newsman who had a panic attack live on Good Morning America, which led him to something he always thought was ridiculous: meditation. He wrote the bestselling book, "10% Happier," started a meditation app, and now, in this podcast, Dan talks with smart people about whether there's anything beyond 10%. Famous life coach Tony Robbins shares proven strategies and tactics to help you get better results out of business, relationships, health and finances. Hopefully, this list will keep you occupied during the summer's hot and hazy days. Stay cool, and don't forget to subscribe to our own Indiana EdCast!